JUBA, South Sudan — President Salva Kiir has presided over the world’s youngest nation as it descended into civil war, famine and a historic refugee crisis. The United Nations says his military is responsible for ethnic cleansing. The United States has imposed sanctions on some of his closest associates. The Trump administration is so worried about South Sudan’s disastrous situation that it is sending Nikki Haley, the U.S. ambassador to the United Nations, to the country later this month. She has criticized its government for perpetrating a conflict that has caused a massive hunger crisis. Other administration officials have suggested that U.S. aid to South Sudan could be withdrawn. Kiir, 66, devoted much of his life to fighting for independence for southern Sudan, which is predominantly Christian and long complained of persecution by the mostly Arab Muslim north. When the south became its own nation in 2011, thanks largely to U.S. assistance, he was named president of a shaky coalition government, propped up by billions of dollars in aid. That coalition collapsed in late 2013, as a clash between Kiir and his first vice president, Riek Machar, widened into ethnic-based fighting. A peace deal was signed in 2014, but it disintegrated. Between 50,000 and 300,000 people have been killed in the war, according to the African Union. It is now, by many measures, the worst humanitarian crisis on the continent. A third of South Sudan’s population is displaced internally or living in refugee camps abroad. While there have been abuses on both sides, human rights groups have documented many incidents in which government troops from Kiir’s Dinka tribe massacred and raped civilians from Machar’s Nuer tribe. “Kiir is the heart of the problem,” said Princeton Lyman, a former U.S. envoy to Sudan and South Sudan. Yet even as the United States threatens to withdraw aid, Kiir has shown no sign of contrition and no intention to reform. And he lashed out against what he considered human rights abuses in United States. “People are being killed on the roads,” he said in an apparent reference to police shootings. He said innocent American children were targeted in gun violence. “Whoever have you found shooting the schoolchildren on the bus here in South Sudan? It is happening in America,” he said in English, without specifying what incident he was alluding to. This year, his country received $730 million in U.S. funding — almost all of it humanitarian relief. South Sudan’s economy is almost nonexistent, and annual inflation was 370 percent at the start of 2017, according to the International Monetary Fund. But Kiir shrugged off American threats to end assistance. “The money belongs to them and whoever they think they should give their money to, it is their right,” he said. “It is not me as a person that will be harmed, but it harms the people of South Sudan, the poor people who are not able to help themselves,” he added. Now, Washington appears intent on pressuring him to change course. Last month, the Treasury Department sanctioned three of his close associates, accusing them of committing human rights abuses and derailing South Sudan’s peace process. Privately, U.S. officials have told members of Kiir’s government that his refusal to accept any responsibility for the conflict is unlikely to go over well with Haley. But experts say Kiir has been conditioned by years of receiving international assistance despite the allegations against his government. “There are no costs to Salva and his government. They get reports written that say ‘This guy did a bad thing.’ But so far there have been no repercussions. That dynamic, I believe, is about to change, as the U.S. is looking at seriously ramping up financial pressures on those responsible for mass atrocities and grand corruption,” said John Prendergast, founder of the Enough Project, an anti-genocide group. In the interview with The Post, Kiir justified his actions in the war. “You either defend yourself or you are swept away,” he said. Over the last two years, the allegations of atrocities by his military have mounted. Amnesty International said that soldiers and allied militias “hunted down and killed civilians, raped and abducted women” in central Leer County in 2015. The United Nations documented 114 killings by pro-government forces in Yei, 90 miles southwest of Juba, from late 2016 to early 2017. During roughly the same period, according to Human Rights Watch, there were “at least 47 unlawful killings by government soldiers” in southern Kajo Keji county. Kiir’s explanation for much of the violence is that rebels wearing stolen military uniforms are committing human rights abuses. “The uniform you have seen outside here with the soldiers is everywhere in the bush and the guns you have seen outside here, they are also outside in the bush with those rebels. These are criminals who pretend to be SPLA,” he said referring to the Sudan People’s Liberation Army, the country’s military. 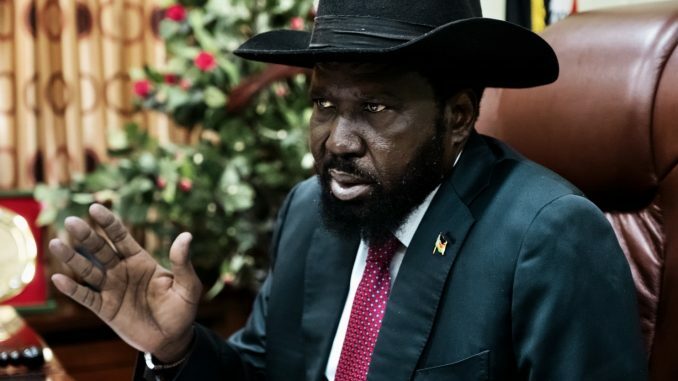 Kiir and his government have also been accused of impeding humanitarian groups trying to distribute food and medical supplies, particularly to places occupied by members of the Nuer tribe, another claim he denies. “The people that are targeted by the U.N. to be given this assistance are my people. Why would I deny them food?” he said. The war Kiir is waging now has become enormously complex. In addition to the fight between the government and the opposition, there are a slew of localized tribal conflicts, often fueled by cattle raiding and revenge killings. Some analysts wonder whether a national peace deal — a long shot at the moment — would stem the intense violence attached to local and ethnic rivalries. In the United States, Kiir was once considered the leader of a morally just fight for independence. He was a guest in Bush’s Oval Office, and a hero to American evangelicals who saw him as representing marginalized Christians defending themselves against Sudan’s Muslim north. He was born in then-Sudan’s Bahr el-Ghazal region, the son of pastoralists. As a young man, he joined southern Sudan’s resistance movement. Kiir said he thinks about her death, but he showed little emotion in discussing it. For decades, he said, he has buried victims of the war. “I always think whoever died from my family died like any other martyrs who died in South Sudan,” he said. Kiir was thrust into statecraft when the leader and hero of the resistance, John Garang, lost his life in a helicopter crash in 2005.